With Rob Cowan. Including Musical challenge; Music in Time: Bruch; Artist of the Week: Giuseppe Sinopoli, featured conducting Schubert's Symphony No 8 and Webern's Symphony, Op 21. Rob's guest this week is the poet, Wendy Cope. After spending 15 years as a primary school teacher, Wendy released her first collection of poetry and it became a surprise bestseller. She's since published three more collections and her poetry has become renowned for being humorous and terse, even when tackling serious subjects such as death. As well as writing poetry for children, she has been commissioned to write poetry to celebrate the 30th anniversary of the Endellion String Quartet, and the 400th anniversary of the death of Shakespeare. 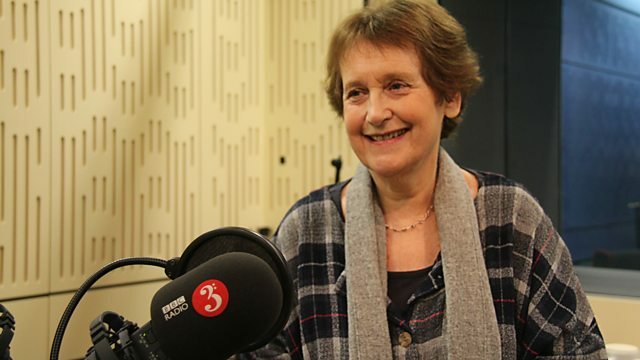 As well as sharing some of her favourite classical music by composers including J.S. Bach, Felix Mendelssohn and Pierre Boulez, Wendy will be discussing her work and life as a writer, and reading some of her music-inspired poetry. Today Rob's in the 20th century exploring a late flowering of Romanticism in music by Max Bruch written in the aftermath of World War One and the death of his wife. Rob's featured artist is the Italian conductor Giuseppe Sinopoli. Sinopoli was not only an immensely talented and original conductor, but also a gifted composer, whose sudden death at the age of 54 was particularly tragic when you consider that many celebrated conductors continue to work well past retirement age. Rob's choices include highly distinctive performances of symphonies by Schubert, Schumann, Liszt and Webern, as well as Beethoven's First Piano Concerto (with Martha Argerich as soloist) and the conclusion of Richard Strauss's hair-raising operatic masterpiece Salome. Performer: Hilko Dumno. Singer: Christoph Prégardien. Performer: Enrico Onofri. Performer: Christophe Coin. Ensemble: Il Giardino Armonico. Director: Giovanni Antonini. Orchestra: RCA Victor Symphony Orchestra. Conductor: Kirill Kondrashin. Performer: Irwin Gage. Singer: Christa Ludwig. Singer: Mary Wiegold. Ensemble: The Composers Ensemble. Conductor: Dominic Muldowney. Composer: Paul Trepte. Performer: Scott Farrell. Choir: Choir of Ely Cathedral. Director: Paul Trepte. Orchestra: State Academic Orchestra of the USSR. Conductor: Evgeny Fyodorovich Svetlanov. Performer: Sandrine Piau. Orchestra: Insula Orchestra. Orchestra: Philharmonia Orchestra. Conductor: Giuseppe Sinopoli. The excerpt we heard in reverse was from the opening of the 1st movement of Schubert's 'Unfinished' Symphony.